This Advent we are going to turn Christmas upside-down! Will you join us? By now we hope you’ve heard a bit about The Advent Conspiracy, but have you picked up your copy of the book yet? Advent begins on December 1st, so there is still time. 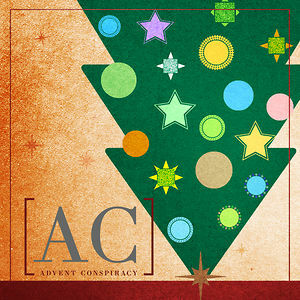 The Advent Conspiracy is a very easy-to-read practical book that will help you think about Christmas in a whole new way. An upside-down way. I was driving by Rockvale Square outlets in the beginning of November, and I noticed all their Christmas decorations were out already. Then I passed The American Music Theater, and they were advertising showings of their Christmas Show that were happening later that day. After I got over my surprise that these businesses were in full-Christmas mode before Thanksgiving, I realized I shouldn’t be surprised. It has been a trend for years now. Christmas is a wonderful thing, and we can be supportive when people and businesses make a big deal about it. And yet we all know that businesses are advertising Christmas earlier and earlier each year, not because they are committed to the Good News of peace on earth through Christ, but for an entirely different reason altogether. They want to make money! And they want you and me to spend our money at their businesses. They would be just thrilled if we actually spend more money than we have to spend. So goes the story of how Christmas got turned upside-down. Now, by us taking Christmas, as we see it today, and turning it upside-down again, we are actually making it right-side-up. But when we do that, when we return Christmas to that state it is supposed to be in, it will look upside-down to the rest of society. That is, however, as it should be, with Jesus’ birth and the Kingdom of God as the focus. Are you ready to turn Christmas upside-down? Get the book. Visit the website. Pray for the Holy Spirit to show up in a mighty in your life and in your family’s life. We are going to have great opportunities for you to participate in: Now that the Operation Christmas Child shoeboxes are on their way, will you begin filling Christmas stockings for Joe Toy in Philly? Then how about joining us for this year’s Christmas Stocking Drop on December 7th? We’ll drive to Philly and work alongside Joe, sharing the Gospel as we hand out our stockings to kids he works with in inner-city Philly. Maybe you’ll consider helping a CV family celebrate Christmas through CVCCS Adopt-a-Family program? See the Community Happenings bulletin board for more details. Will you join us on December 15th as we sing carols to homebound members of Faith Church? Or perhaps you help CVCCS with their Christmas food box giveaway on the 21st? There are so many ways you and your family can participate in the Advent Conspiracy, turning Christmas upside-down! It was wonderful to sing songs of thanksgiving to God this past Sunday. Great to celebrate communion together, to give thanks (which is the meaning of the word eucharist) to the Lord for his amazing gift of love to us. It was also great to talk more about growing the discipline of thanksgiving at sermon discussion group. We also had a great gathering of area churches for our community Thanksgiving service. It’s great to see all your “thankful” posts as we march toward the holidays. However, I’m reminded that in the midst of all these posts about what we are thankful for, there are some among us who feel pain stronger than their thankfulness. Those who’ve lost loved ones close to them… people who celebrated these holidays with them last year or the year before that. Our family lost a friend and neighbor this year and know others who may be headed into their final holiday season this year. There are those who have families that are broken and dysfunctional, for whom this season is full of stress and heartache. If that is part of your story this year, know that we are with you and that it is okay to feel sad when everyone else seems to be rejoicing. There are also those who feel unable to participate in all the ‘festivities’ because of the pressure to spend, spend, spend, and consume, consume, consume. For those without means, the ‘gift-giving’ season is just another reminder of what they do not have and cannot provide. My family is fortunate to have the means by which we can participate in the gift economy this year. However, we know plenty of people who struggle to pay their bills every month and for whom the idea of spending any money at all on gifts is out of the question. Do not feel ashamed or inadequate. We are with you. There is much we can all be thankful for, but thankfulness doesn’t always erase all the pain. If you are hurting, my prayers are with you and for you. I am thankful for you. Does that resonate with you? What will you do to cultivate the discipline of thankfulness? I found this quote that made me wonder how you might be thinking during this season of Thanksgiving. There are plenty of people who don’t feel thankful at Thanksgiving. Life is very hard. Maybe you’re one of those people who is struggling. Know that you’re not alone, and there is hope! Sometime you might consider doing a study into the history of holidays. When and why were they started. You might be surprised. I was surprised to learn that this year is actually the 150th anniversary of Thanksgiving, despite the fact that we attribute its beginning to the Puritans in 1621. Along with the Battle of Gettysburg and the Gettysburg Address, Thanksgiving hits a major milestone, thanks to Abraham Lincoln. In the church we make a big deal out of Christmas and Easter as the two most important days in the Christian calendar, as we should. For me, Thanksgiving makes a great case for coming in third place just behind those two days. We see over and over again in Scripture how vital an attitude of thanksgiving is. So how are you doing with being thankful? This Sunday we look at how to cultivate the discipline of thanksgiving. Then join us on Sunday evening at Zion Lutheran Church in Leola for a Community Thanksgiving service, 7pm. And then again on Wednesday evening for our annual Thanksgiving prayer service, 7pm. With this Sunday, two months of many guest teachers comes to a close. I have enjoyed it immensely, and I hope you have as well. This Sunday our worship leader, Becka Beard, is preaching on the image of God. The image of God has been a hotly debated topic in the church for centuries. What is the big deal? In what sense are we made in the image of God, and what does it matter to our lives? Take a moment before you come on Sunday to consider what it might mean to be made in the image of God…does it have any effect on the way we live and interact? Yesterday at Faith Church we had a special treat as Yoriyoshi and Emiko Abe visited, encouraging through the preaching of the Word and leading us in worship. Yoriyoshi told us how the Lord worked in his life, tying that in with the wonderful words found in Isaiah 55:1-3. Emiko closed the sermon by leading us in a new song. It is actually a Japanese worship song translated “Who Can Satisfy Our Souls?” It was the perfect choice for the sermon, and it is a beautiful song. As you read the song, may it be your prayer. Who can satisfy but you? What do you need to do make this prayer a reality in your life? This Sunday we welcome Yoriyoshi and Emiko Abe from Japan! I first met Yoriyoshi about ten years ago when he visited Lancaster, considering studying at the Bible College. That ultimately didn’t happen, but in recent years the Lord brought him to Myerstown to study at our seminary. Yoriyoshi’s family has a long-time history with the EC Church of Japan. This past summer he and Emiko were married, and they both returned to Myerstown so that Yoriyoshi could finish his studies. He currently serves as Pastoral Intern at our sister church, Grace Community of Willow Street. Once he graduates, they will seek the Lord’s will about future ministry opportunities. I’m excited to hear from this couple on Sunday! Yoriyoshi will be preaching and Emiko will worship in song. I was in seminary with Yoriyoshi’s cousin Tomo. Think about this: when they come to our seminary, those guys are studying in a language that is not their birth tongue. That alone blows me away. But add on top of that, a significant section of their coursework is to study theology, which in itself can be complicated, let alone in another language. Yet there’s more. They also study biblical Hebrew and Greek, taught to them in English. And their birth language is Japanese! I praise the Lord for the gifts he gives his people. Yoriyoshi will be speaking on Isaiah 55:1-3, “Who can satisfy us?” Do you ever feel less than satisfied with life? I definitely do sometimes. Think you should have made more money by this time? Have more socked away for retirement? Think you should have accomplished something more? Made it big? Do you have a nagging feeling within you? Are you disatisfied? Pray that the Lord will speak to you on Sunday. Multiple worship services ARE of the devil! Yes, having multiple worship services are of the devil…if we let them be. It is very interesting how we go through life and end up changing our minds about things. For example, how did I go from this to this? If you don’t want to fully read those two blog posts, here’s a brief summary. In the first post, written in February, I make the argument that it would be wrong for us to have multiple worship services because people need to give up their consumer mindset and be unified. In the second post, written last week, I explain that in June we started a second worship! All it took was the short time from February to June for my mind to change. Actually it was a bit quicker than that because the decision to start an early traditional worship service was made in April or May. I remember during that time feeling a bit like a hypocrite. I had written an impassioned blog post decrying consumeristic Christianity (which I still agree is a problem), and now I’m appearing to give in to consumerism. I remember the series of meetings our church Council had about it. Things got very emotional. People were making points to support their position, and we didn’t have any kind of consensus. Between meetings I thought and prayed about it a lot. I talked with people and sought out their wisdom. At one point a different perspective struck me. When God wanted to express his amazing love to us, he didn’t say “Jump through these hoops and get to me.” Instead, he knew we were unable to reach him, and he gave up a whole heck of a lot to reach us. Philippians 2:1-11 tells the story pretty well. As I thought about Jesus’ sacrificial love for us, I compared that to our worship situation. For the previous six years we had asked people to sacrifice in order to worship together. But this was the opposite of how God looked at us. No doubt God calls for us to sacrifice for him, but he took the first massive step. I pondered this and knew my heart and mind was changing. When it came to worship, we, the leadership, first needed to sacrifice for our people before asking them to sacrifice. We needed to give of ourselves as an act of love. That act of love needed to be a new worship service specifically for people who prefer a traditional style. At the next meeting, I sat quietly while the Council debated numerous ideas. After 30, 40, or 50 minutes, I don’t know, I decided to submit my proposal. I explained the change in my heart and mind, and then I suggested that we start an 8am service in a traditional style. No volunteers, just me in a suit and tie, and our worship leader playing hymns. We would use the offering plates and the doxology. Same order of worship every week. An act of love. I expected 5-10 people to show up, with 10 being a victory. I was afraid it would be only 5. For five months now, we’ve averaged 15. It’s tiny, but that doesn’t matter. It’s not about numbers, but instead about giving in love. After a three month trial the attenders thought we would shut it down, but instead we removed the “trial period” label and made it a permanent service. We’ve found at least one unexpected benefit: people who are serving in various ministries and would normally have to miss the 9:30 worship can now come to the early service. Are there any downsides? Sure. Our worship leader has to wake up earlier and prepare a whole set of extra songs. We used to have a Sunday AM worship practice prior to the 9:30 service, but that is now impossible, so she also has to have a new practice time on a weekday night. She has graciously sacrificed more for this venture than anyone. I have to get up earlier too. Unity cannot be accomplished by sitting in the same room as other people during a worship service. To borrow an illustration that Billy Graham used about shots, such as flu shots: perhaps by having worship together, and thus having a small dose of fellowship each week, we’ve inoculated ourselves from the real thing. Building a relationship that leads to unity takes a lot of time outside the walls of the church. Let’s envision fellowship in a whole new way. Miss people from the other service? Give them a call, a visit, take them out for lunch, coffee, and spend a good long time with them. Then do it again and again. Invite them to dinner. Pray together, serve together, etc. Unity takes work. Unity is not easy. Unity can be messy. Unity requires sacrifices. So how are you going to pursue unity with the people at the other worship service?